As I will be moving soon I will be needing a new router for managing my home network. There are hundreds of routers availble at various prices in many stores but I knew I wanted something beefier than most consumer routers and preferably run my favourite router firmware on it: OpenWRT. With that in mind, I researched a handful of candidates and decided on the Ubiquiti EdgeRouter X. It's a small 5-port gigabit router with no wireless support but sports a dualcore Mediatek MIPS processor and has both 256MB of RAM and NAND Flash. The inreased RAM and Flash size compared to most consumer routers would come in very handy with OpenWRT as it would allow me to install plenty of extra software packages later on, and allow me to use the storage for saving any logs or other files. The lack of WiFi support didn't bother me, this router will be mounted near my front door where the cable modem will reside and I would like my WiFi AP to have a somewhat more central location in the house anyway. So, I had chosen for this EdgeRouter X, but I knew there was one catch: barely any information on getting OpenWRT on it seemed to be available. The OpenWRT techdata page listed some of the router's details but little else, and the OpenWRT device page was almost completely barren. It did however feature a picture of the internal serial port, which came in handy later. 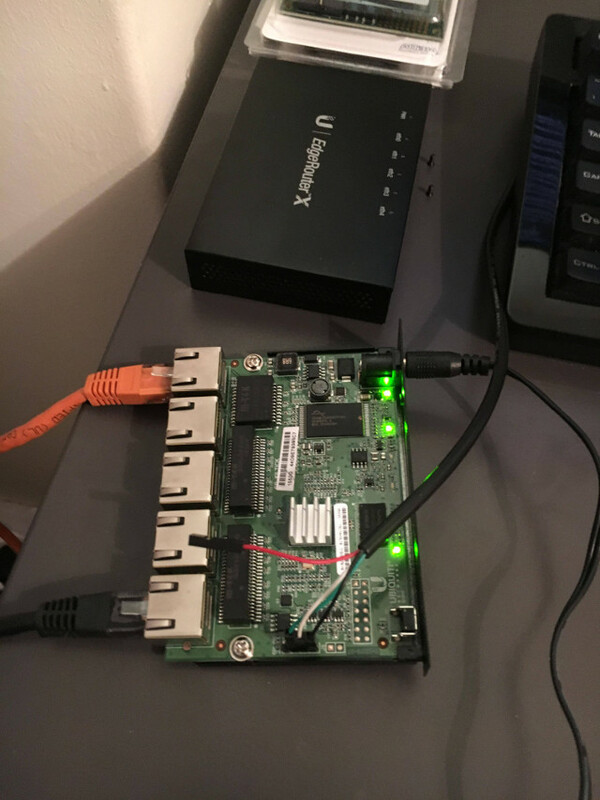 The most promising resource appeared to be a topic on the OpenWRT forums which showed that at least two people had gotten OpenWRT running on it, and that gave me just enough hope to give it a try myself. 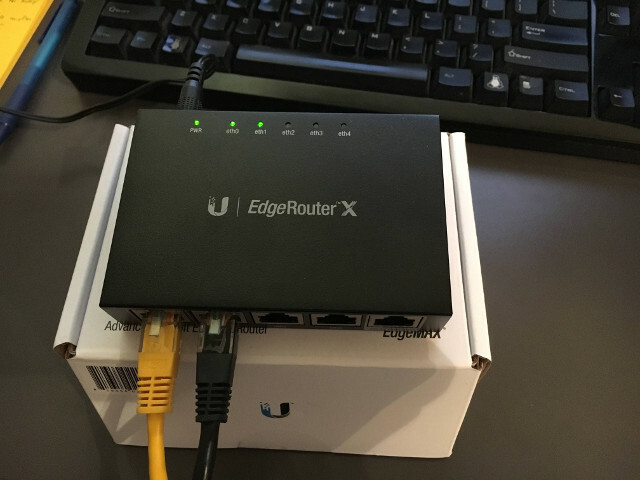 The Ubiquiti EdgeRouter X comes with the EdgeOS firmware by default. Contrary to the stock firmware on many consumer routers, this firmware is actually regarded as pretty decent and provides many features. Before flashing OpenWRT on the router, I had a little look around EdgeOS first. After logging in on the web UI, the user is presented with some general live graphs on the first page and a status for all five ethernet ports. From here on many settings can be configured on either the main page or any of the other pages. I did notice however that my browser asked me if this website was allowed to run Flash. Why a router needs Flash on its web interface is beyond me. SSH is enabled by default and you can log in with the same user credentials as for the web interface. Upon logging in, surprisingly enough I am greeted with a real bash shell. The linux version appears to be 3.10.14, and the presence of a /etc/debian_version file (containing "7.8") hints to me that the firmware is based on Debian. I wouldn't be surprised if it would be possible to use the official Debian repositories to install additional packages on this firmware. I'm not entirely sure what the SPI_FLASH is used for, but the firmware resides on the NAND flash (recognisable by the different erasesize). The ALL partition covers the same memory as all the following partitions toghether. U-Boot and its configuration resides on mtd2 and mtd3 respectively. The eeprom partition probably contains some settings for the router hardware, though I can't be too sure. After that two kernels are present, the second one as a fallback in case of a bad upgrade or flash corruption. Finally, the last and largest partition is used for the RW root filesystem (ubifs). The forum topic that I mentioned in the introduction of this article included a post that referred to a patch submitted in November 2015 introducing support for this specific device. This patch would've been too recent to have made it into a stable release of OpenWRT yet, so this meant I was going to be running the trunk version. The techdata page links to a nightly built trunk image specifically for this device, but this image is a sysupgrade image. When you are still running the stock firmware, this image won't do. The router needs to already be running OpenWRT if you want to use the sysupgrade image. For the purpose of getting the router on OpenWRT in the first place, so-called factory images are used. Looking through the nightly built trunk images, there was a noticable lack of this factory image however. Time to compile my own. At this point, you will be asked how you want your Linux kernel and rootfs to be configured. Initially, I chose Mediatek Ralink ARM as the Target System. About 24 hours later, I realised that that had been a mistake as I couldn't manage to get any images generated without a load of compilation errors. Confusingly enough, when compiling for a Mediatek platform, for Target System you should choose Ralink RT288x/RT3xxx. This in turn enables you to choose from various Mediatek subtargets, in the case of the Ubiquiti EdgeRouter X you choose MT7621 based boards. Having done that, there will be a Target Profile specifically for this router. Now this feels a lot more reassuring than my earlier option where I couldn't choose subtargets or a profile. Having ran make -j3 V=s (verbose compilation with 3 workers) I went into bin/ramips and found an image for my router! But, it's the same sysupgrade image that was available online, I still don't have the factory image I was looking for. Some thinking and exploration of the options in make menuconfig later, I realised what I needed to do. The factory images are different from the sysupgrade images in that they combine the kernel with a filesystem toghether, this is also called initramfs. Under Target Images, select ramdisk and leave the compression on lzma as it is. When doing another compilation run now, you end up with the factory images in addition to the sysupgrade image. Now I needed to find a way to actually get OpenWRT on the router. There are likely multiple approaches to accomplishing this, but I went with what I believed to be the path of least resistance. I spotted the router to have just two small screws and decided to remove these. After this, the casing opens right up without breaking any stickers and as such this shouldn't affect your warranty. Low and behold, the pin headers for a serial connection are easily spotted and better yet: they are already populated! I grabbed my Adafruit-style USB to serial converter cable and hooked it up as per the pinout described on the OpenWRT device page. I launched the screen utility, set the baudrate to 57600, and I was awarded with a working serial connection. I have not come across many devices where it was this easy to set serial up. Option 4 presents you with a classical U-Boot prompt and allows you to fiddle with the environment and run any supported commands. I was curious about option 1 though. This option claims to use TFTP to load an image from the network into RAM and then boot that image accordingly, a perfect approach to trying out an image without having to make any changes to the data present on the Flash memory. Success! The router continued to boot the default option 3 and this time round OpenWRT booted from Flash. Contrary to the initramfs image, the UBIFS on the Flash got mounted too now and this gives you a nice and spacious RW root overlay. Mission accomplished! Now remains one important task, and that is to update the OpenWRT wiki with the information I have found during this little excercise.